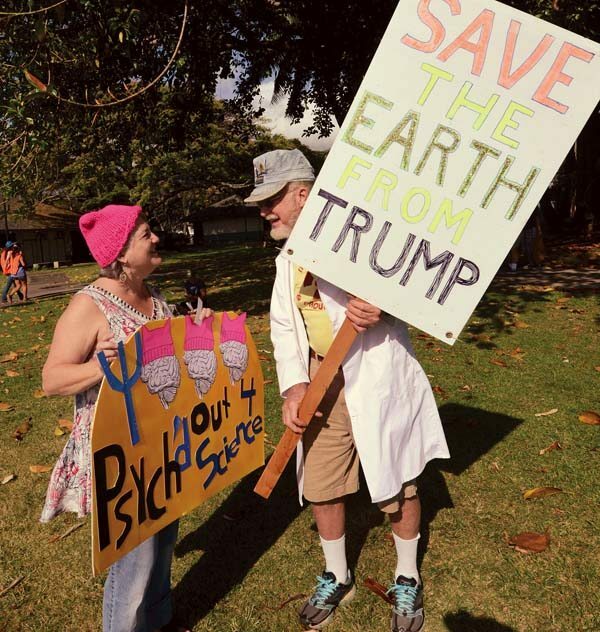 Wailuku research psychologist Terri Erwin and Kihei retired nuclear engineer Buck Joiner talk before the start of Saturday’s March for Science at the University of Hawaii Maui College. Joiner served on the Three Mile Island Recovery Team after the nuclear power plant in Pennsylvania suffered a partial meltdown in 1979. He called President Donald Trump a “one-man environmental and constitutional catastrophe.” Erwin said science is becoming a victim of “confirmation bias” as people reject hard data and research in favor of what they already believe. The march was part of a worldwide effort. “We’re happy to be part of this very important international event,” said UH-Maui Sustainability Club member Ananda Stone. Rallies were held Saturday in more than 600 cities around the globe.